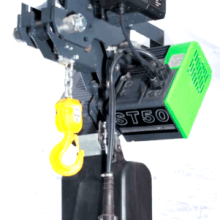 Modular hoisting system – customisable to suit many lifting applications up to 6300kg. 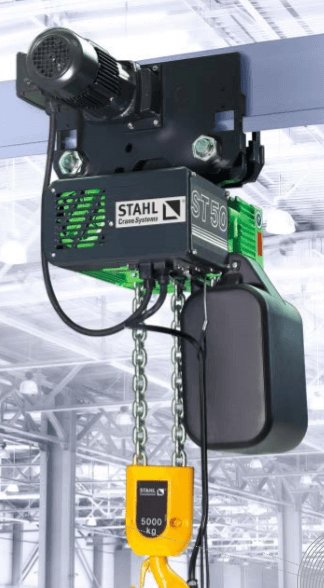 The Stahl electric chain hoist enables innovative hoisting solutions thanks to its modular design. 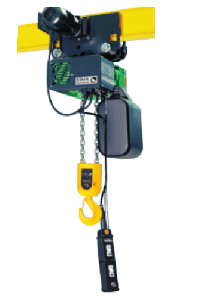 Not only can it be used as a standard electric chain hoist, it can be assembled in many different combinations in order to lift loads in awkward situations. 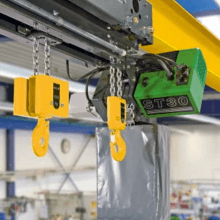 Such as the STD dual chain hoist, with its 2 pickup points it is ideal for handling long loads and can be configured in many ways; or a version suitable for wind turbines, big bag handling hoists are another option. 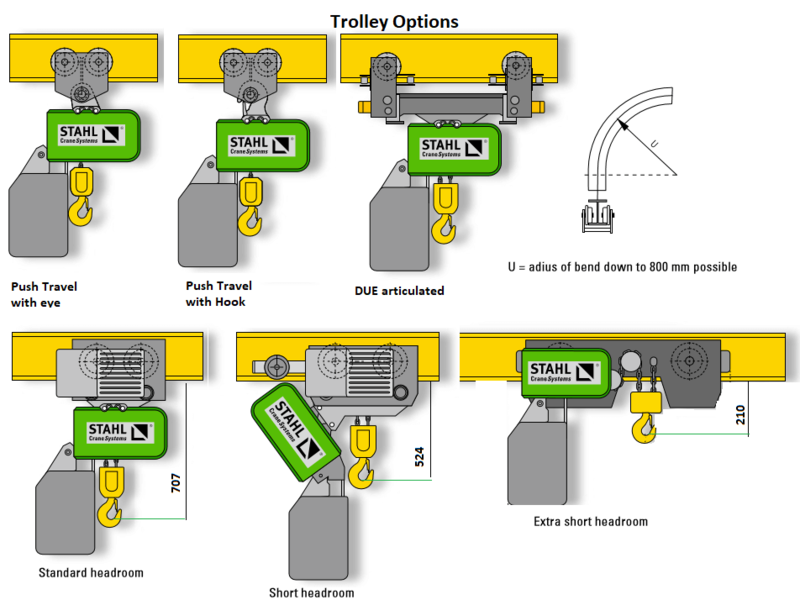 There are also a number of trolley systems allowing a range of configurations with the Stahl ST electric chain hoist. A further bonus of the ST hoist is the range of suspension options; these are hook, eye and rigid suspensions as well as foot mounting options. 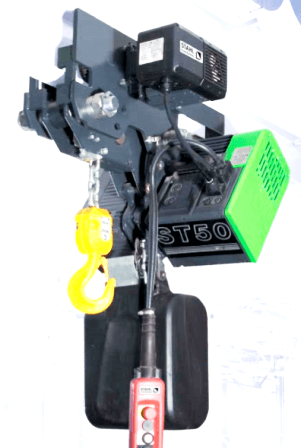 With 6 models available in a range of lifting capacities up to 6300kg, there will be a Stahl ST electric chain hoist to suit your lifting application. 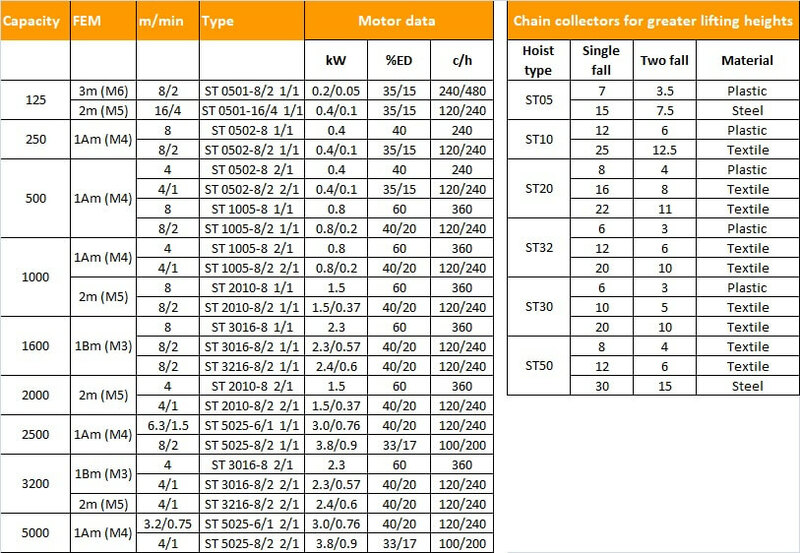 The components which make the Stahl ST Chain hoist one of the best are all made to the highest quality using the latest technology, to ensure high efficiency, continual performance and a long service life. 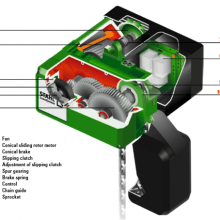 MOTOR; The high power motor has 2 hoisting and travel speeds for precise positioning; standard fan cooling, and Ptc thermistor temperature control all to high standard in accordance with FEM. CHAIN DRIVE; Load bearing & anchorage components are incorporated into the solid cast iron chain guide enabling load support where it engages; enclosed, self-lubricating chain guide; water resistant chain sprocket with optimised return sheaves for low chain wear; easy inspection of the chain sprocket due to the over-mounted shaft bearing. BRAKE: The electro-magnetic disc brake is asbestos free and needs little maintenance; oversized braking torque; safe, even in inching operation; wear to the brake can be checked. The brake is totally enclosed and therefore well protected from ingress of foreign particles. OVERLOAD: the overloading protection comes from the slip clutch and gear, (On ST10 to ST60 clutch is in the oil-cooled gear); Easy to adjust; no electronic limiting needed; Gear reductions available. 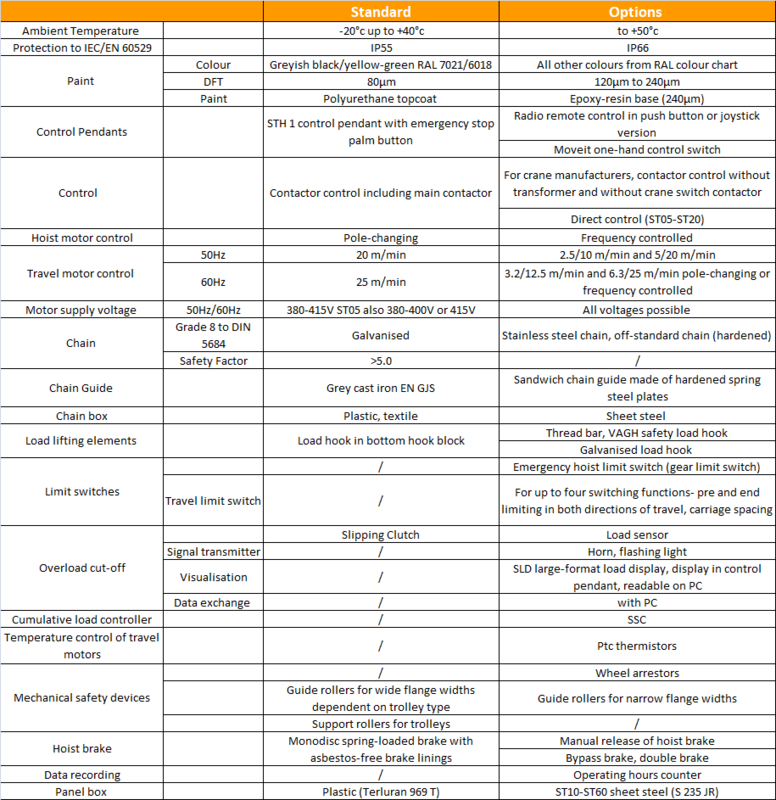 CONTROL: All control voltages and connections are available; control pendant and travel motor have plug connection; Contactors have a clear arrangement; other options available including, direct control & without control pendant and/or contactor control. CHAIN & BOX: The chain stores easily in the chain box which can be plastic, steel or textile. The load chain is made from hardened galvanised steel to a high FEM classification. OTHER OPTIONS: Standard control pendants, radio remote control and RMI 'radiomoveit' radio control available. SMC multi controller; SSC cumulative load control; operational hoist limit switch; steel chain guide; bypass brake; vibration dampener; load display and slip clutch test device. 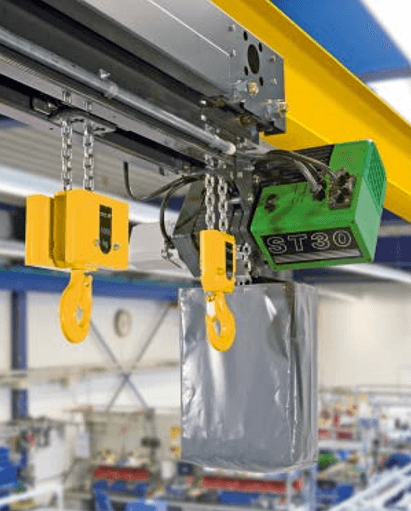 There are a number of ways to mount the Stahl ST electric chain hoist; the standard is the hook suspension which is ideal if the hoist will need to be moved often. 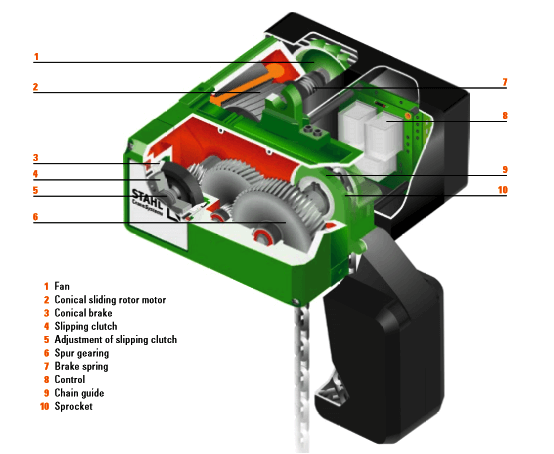 Instead of the hook you could choose the 'eye' option which is ideal if the hoist will nearly always used in the same place and/or need a lower headroom option; or you could choose the rigid suspension for a more permanent mounting option, this option gives you the lowest headroom mounting. It is also possible to base or foot mount the ST chain hoist by bolting from below the hoist, this can be useful for very low ceiling areas. PUSH TRAVEL TROLLEY: This is a standard trolley system for hook or eye mounted hoists is very smooth running. DUE Articulated Trolley: This special trolley system is ideal for frequent travel around bends and curved track. Dependent upon the bend radius and flange width the trolley may have one or two motors. The lateral rollers enable minimal wear and it can be used for loads up to 6300kg. Electric Trolley - Standard Headroom: A smooth running electric trolley with short headroom to enable long hook paths. Electric Trolley - Extra Short Headroom: The STK trolley provides the shortest possible headroom, up to around 60% in fact. This can be tremendously beneficial for low ceiling buildings.